okay what's up with the groceries? Have you ever left groceries in your car? I don't understand. And when mom read this she giggled. 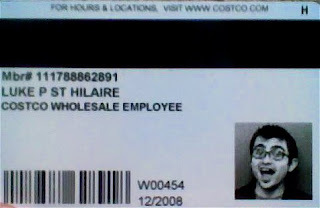 okay... that employee id card is one of the better things i've seen in awhile. Thanks for the kind words! The camera is a Cannon powershot SD 630. Seriously, it's a couple years old now, but takes amazing pictures. It's only 6.0 and the new ones are 10 I think! I also process everything through iPhoto, so each picture looks pretty good! !